Water and ethanol forms an Azeotropic composition, restricts dehydration of Ethanol. 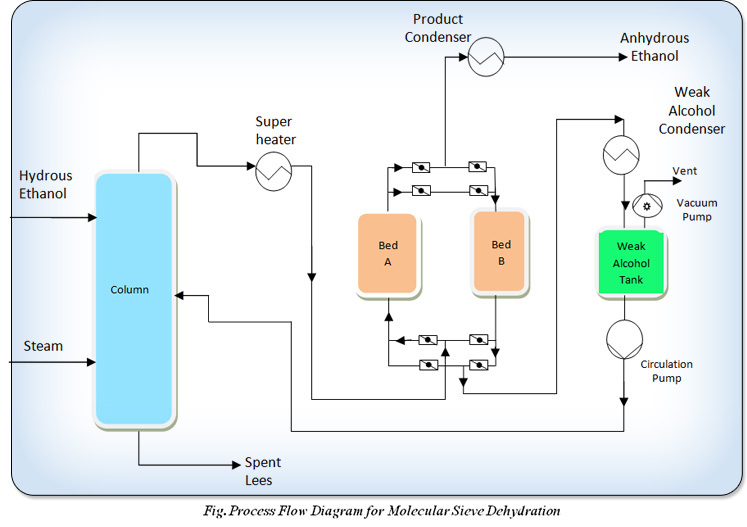 Conventional distillation with addition of entrainer can be used to overcome limiting the amount of water removal. To obtain anhydrous ethanol PSA (Pressure Swing Adsorption) Technology removes water from the ethanol/water vapor mixture leaving the rectification column. The dehydrated product can be tailor maid up to the specific requirements of the client with a water content of 0.5% with higher yield of product for pharmaceutical or industrial applications. 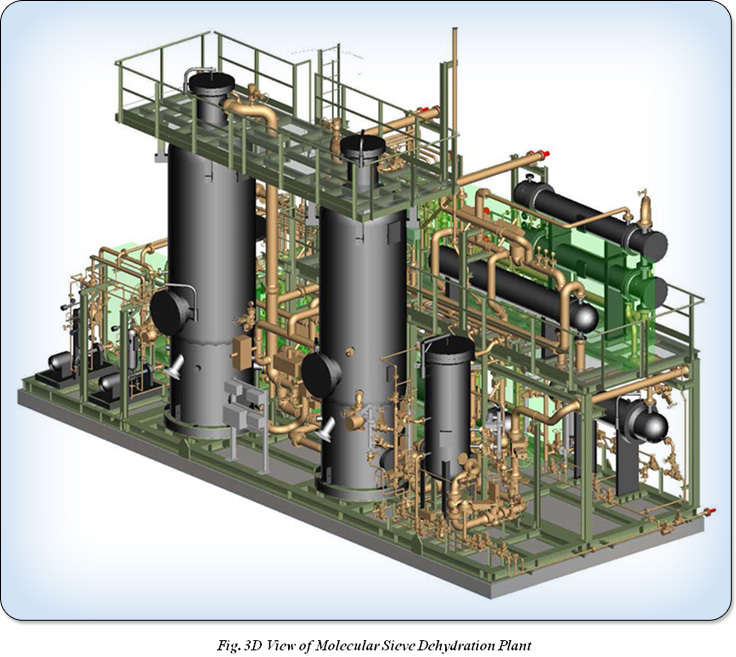 It’s a continuous process to produce Dehydrated Ethanol by pressure swing adsorption system with two molecular sieve beds. While one bed is working for dehydration and the other is regenerated under vacuum. During the regeneration phase the bed pressure is lowered and the desorbed water is swept out of the bed by product vapors from the other bed in dehydration service. This regeneration, or “purge” stream is then condensed and pumped to the distillation unit for recovery of ethanol. Molecular sieves are highly porous crystalline materials made up of aluminosilicates. These synthetic crystals are characterized by a three-dimensional pore system, with pores of precisely defined diameter. Synthetic sieves are available with openings from 3 to 10 Ångströms (Å). 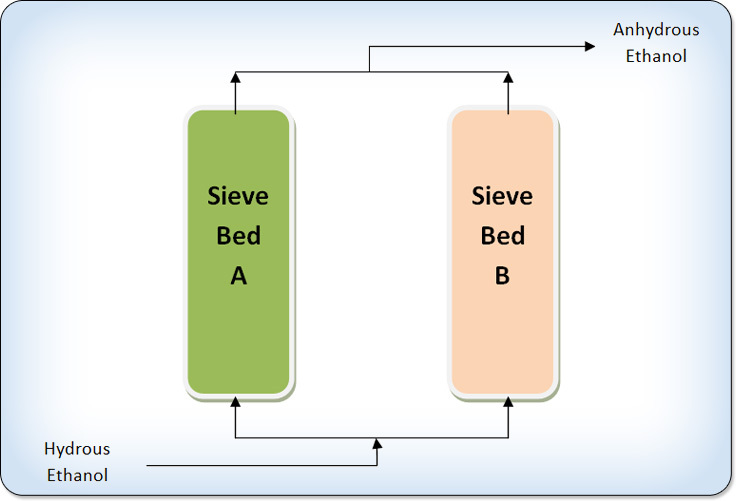 In ethanol dehydration, 3Å sieves (pore diameter of 3Å) are used to separate water from ethanol. The small water molecules, with a diameter of 2.5Å, are retained in the crystals by adsorption, but the larger ethanol molecules (4Å) cannot enter and therefore pass through the bed. Handles Azeotropic composition of Ethanol/Water etc.